NORFOLK—A 2004 Aura De Laurentus graduate and Olongapo, Philippines native is serving in the U.S. Navy aboard the aircraft carrier, PCU Gerald R. Ford (CVN 78). Airman Regine Garcia is an aviation boatswain's mate (handling) aboard the Ford-class aircraft carrier operating out of Norfolk, Virginia. A Navy aviation boatswain's mate (handling) is responsible for flight deck firefighting and directing aircraft. “I like that we have the opportunity to save lives,” said Ms. Garcia. Named after the 38th US President, Gerald Rudolph Ford Jr., the Ford-class aircraft carrier is 1,092 feet long and hosts a wide array of quality of life improvements and state-of-the-art upgrades from a Nimitz-class aircraft carrier. New technology, including a new reactor plant, propulsion systems, electric plant, Electromagnetic Aircraft Launch System (EMALS), advanced arresting gear and integrated warfare systems enables the Navy to operate the ship with less manpower, contributing to the Navy saving approximately $4 billion in total ownership costs over the ship’s 50‐year life when compared to NIMITZ-class. 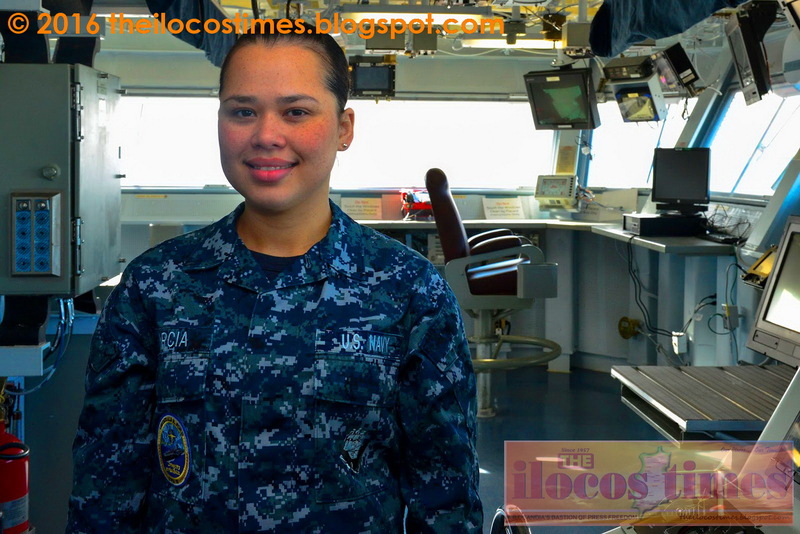 “It's a privilege to be stationed aboard a new class of ship,” said Ms. Garcia. Approximately 170 officers and 2000 enlisted men and women make up the ship's company, each highly specialized and operating in a number of jobs ranging from managing shipboard telecommunications networks and damage control systems to maintaining machinery and weapons. With more than 40 new or modified systems, Ford Sailors are unique in their training as many are among the first in the Fleet to train on and operate the ship’s cutting edge technology. The crew continues to explore innovative training solutions as Sailors prepare to take ownership of equipment and systems from contractors and shipbuilders. While Ford has yet to conduct its first mission abroad, those serving aboard this ship will experience things that most Sailors don’t get to, being a part of the ship’s initial crew. The crew must be highly motivated and adapt quickly to changing conditions to ensure the ship is ready to defend America at all times when called upon. There are high expectations for this ship and its Sailors; however, the crew is thriving under pressure. “The Navy has taught me a lot of life skills that I will use while serving and beyond,” said Ms. Garcia. As a member of the U.S. Navy’s newest aircraft carrier, Garcia and other Ford Sailors are excited to be a part of the crew that will take this advanced war-fighting vessel on its first voyage to protect this country on the world’s oceans.